Solid financing is essential when exporting to mature markets. Credit Suisse will support you as the Bank for Entrepreneurs. Switzerland is an exporting country. In 2018, the country exported goods worth 233 billion francs. In terms of gross domestic product, this accounts for two-thirds of total economic output. 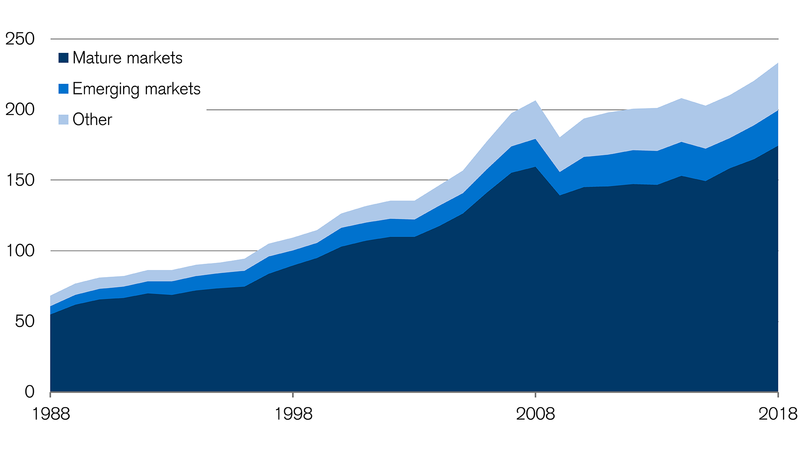 By far the largest proportion of Swiss exports goes to mature markets. Therefore, at the Forum for Swiss Foreign Trade and Investment, Swiss business leaders discussed how to grow successfully in mature markets. In the breakout session "Where are we heading in mature markets?" Credit Suisse experts considered the future. Mature markets currently account for three out of every four Swiss francs generated by exports: How will this proportion develop in the future? Sascha Jucker: The proportion has not changed very much in recent years. However, the mature markets' share has tended to be in a slight downward direction. By contrast, emerging markets are increasing in importance for Swiss exports, to some extent. China's purchasing power in particular is growing. But the development is taking place very, very slowly. I expect that the share of Swiss exports going to mature markets will fall to no less than 70 percent over the next few years. You mention China. Will the country become as important for Swiss exports as some people expect? For luxury goods such as watches, China really is an exciting market owing to the large population and the purchasing power of the upper class. But this does not apply to all sectors equally. Industry, for example the automotive industry, is highly dependent on Germany. That will not change. It certainly makes sense for Swiss exporters to establish themselves in China. But the other markets, in particular mature markets, should not be neglected. Which export markets are particularly important for Switzerland? Europe, especially Germany, is crucial for Swiss exports and will remain so. Many people underestimate this. Soft factors such as our similar cultural background facilitate trade with neighboring countries. In Asia or Latin America, that is completely different. But even here, the potential is very promising in some cases, such as large countries like Brazil. However, it is important not to opt for a new market purely because of the current economic situation, but also to take other conditions such as political stability into account. Competition is fierce in mature markets. And so Swiss exports must win people over right from the start. Find out how that can succeed. What is the situation like in the US? That is the second most common destination for Swiss exports. As with exporting to neighboring countries, there are hardly any language barriers in the US for Swiss exporters. Of particular interest in the US is the healthcare sector. It is less tightly regulated and the healthcare market is growing fast. Demographic aging will ensure that there is continuing demand. Emerging markets will see above-average growth, but their market share is small. Which markets will be important for Swiss exporters in the next few years? Basic growth will continue globally in most countries. Emerging markets will see above-average growth, but their market share is small and exporters have to overcome considerable obstacles in some cases. Among the mature markets, the US is likely to record the strongest growth. At the Forum for Swiss Foreign Trade and Investment, the slowdown of growth in Europe was mentioned. What is the cause of this? We had strong growth in 2017 and the first half of 2018. Then came a slowdown at the end of 2018. This is completely normal in the economic cycle, particularly in the industrial sector. On the one hand, we had exceptional temporary factors such as the hot summer of 2018, which led to weakening growth. On the other hand, the trade dispute between the US and China created uncertainty. 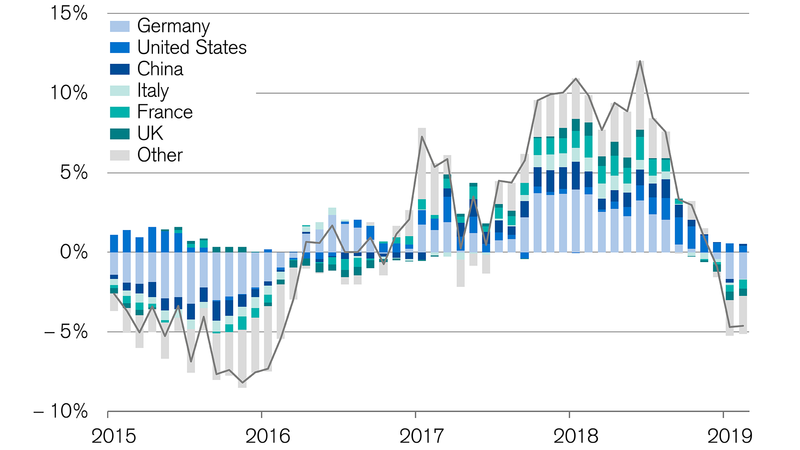 Germany in particular subsequently recorded weaker demand from China. However, this mainly affects the industrial sector. The services sector and the labor market remain sound. Swiss exports also react to demand from China – though primarily in an indirect manner. Which sectors are particularly affected. Will the economic situation in the mature markets soon rebound? In fact, the most likely scenario is that we have already reached the low point. The European economy is likely to recover in the coming months. We can already see the first positive growth momentum from China. By contrast, if the downturn continued, this would sooner or later be reflected in the labor market. A recession would then be the worst case scenario. However, we do not expect that to happen. The export sector is important for the Swiss economy. But how dependent is Switzerland on developments in other countries in real terms? Since we are not one of the major economies, we are rarely the number one trading partner for another country. This also means that we are not usually one of the first countries to suffer in the event of an economic slump. Swiss companies often operate in niche markets or sectors that are less economically sensitive. The best examples of this are the pharmaceutical industry, the medtech sector and the watch industry, but the same applies to the textile industry, which has specialized in highly functional textiles. Therefore, the quality of Swiss products protects us from price pressure to a certain extent. Nonetheless, it is good to diversify and be present in several markets. Especially the dominance of the mature markets will continue for several decades yet. Credit Suisse's export study, which was compiled as part of the Forum for Swiss Foreign Trade and Investment, also focuses on the mature markets. Discover some facts and practical tips for exporting to Germany, France, Canada, Japan, and the US. Would you like to receive support in exporting to mature markets? We will be happy to help. Call us at +41 (0)800 88 88 71.